Talk about one stop shopping… with this set you have everything you need to walk straight out to the 1st tee. That's the good news. The other good news is that if you bought these pieces separately it would cost you at least five times as much. Actually, that's the good news and the bad news all rolled into one because when you buy these complete sets you are almost always giving up some quality. Let's take a closer look at this set and I'll give you an honest evaluation of what you are buying. I'll begin with the big dog and work my way down to the flat stick. The driver has a big oversized 460cc head with 13 degrees of loft. The loft is high for a driver and is designed to help beginners hit the ball in the air more easily. The huge head is to inspire confidence. Although it's fun to swing this big stick, when teeing off I'd recommend you swing your 3 wood (with 17 degrees of loft) or 5 wood (with 23 degrees of loft) or even your 7 wood (with 26 degrees of loft). That is until you get more consistent with your golf swing, then move to the big stick. The bag is actually pretty cool too. I don't usually like the bags that come with these inclusive sets, but this one is pretty cool. Not only does it have Callaway's cool branding on it, it has an insulated beverage pocket to keep your drinks cold. This could pay for the whole set if it keeps you from spending your cash on the beer cart out on the golf course. The only thing I don't like about the set is the putter. Putters are pretty personal, and you should spend some time picking out a good one that fills you with confidence. Think about it, you hit your putter on average about two times a hole. (That’s if you are lucky.) What’s more is this is the scoring club. There are about a million different shapes, sizes and designs. For you beginners, I would recommend a mallet style putter (like the one that comes in this set) with a big alignment aid. The mallets are a bit more forgiving than the blades and you will make more short putts. All in all, this is a good set for those just getting into the game. This set should last you for a few years until you become obsessed (like the rest of us) and take your game to the next level. 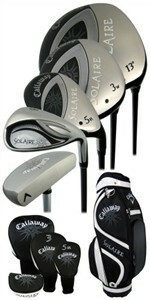 For a smaller less expensive set, check out the Solaire 9-Piece Complete Club Set.